Accumulating evidence indicates that astrocytes are actively involved in brain function by regulating synaptic activity and plasticity. Different gliotransmitters, such as glutamate, ATP, GABA or D-serine, released form astrocytes have been shown to induce different forms of synaptic regulation. However, whether a single astrocyte may release different gliotransmitters is unknown. Here we show that mouse hippocampal astrocytes activated by endogenous (neuron-released endocannabinoids or GABA) or exogenous (single astrocyte Ca2+ uncaging) stimuli modulate putative single CA3-CA1 hippocampal synapses. The astrocyte-mediated synaptic modulation was biphasic and consisted of an initial glutamate-mediated potentiation followed by a purinergic-mediated depression of neurotransmitter release. The temporal dynamic properties of this biphasic synaptic regulation depended on the firing frequency and duration of the neuronal activity that stimulated astrocytes. Present results indicate that single astrocytes can decode neuronal activity and, in response, release distinct gliotransmitters to differentially regulate neurotransmission at putative single synapses. Astrocytes play key roles in brain homeostasis, such as, neurotransmitter uptake, water and ion balance, and blood flow control (Simard and Nedergaard, 2004; Huang et al., 2004). In addition, astrocytes are emerging as cells with relevant roles in synaptic function, being active players of the Tripartite Synapse (Araque et al., 1999). They express a wide variety of functional receptors that can be activated by neurotransmitters (Araque et al., 2001; Haydon and Carmignoto, 2006; Perea et al., 2009; Volterra et al., 2014; Araque et al., 2014; Navarrete and Araque, 2010; Panatier et al., 2011; Volterra et al., 2005; Di Castro et al., 2011; Perea et al., 2016; Mariotti et al., 2018), and they can release different gliotransmitters, such as glutamate, GABA, ATP and D-serine, which activate neuronal receptors (Araque et al., 2014; Navarrete and Araque, 2010; Panatier et al., 2011; Volterra et al., 2005; Di Castro et al., 2011; Perea et al., 2016; Perea and Araque, 2007; Parri et al., 2001; Bezzi et al., 2004; Martín et al., 2015; Min and Nevian, 2012; Halassa and Haydon, 2010) and regulate synaptic transmission and plasticity (Panatier et al., 2011; Perea and Araque, 2007; Martín et al., 2015; Min and Nevian, 2012; Halassa and Haydon, 2010; Covelo and Araque, 2016; Henneberger et al., 2010; Min et al., 2012). Numerous studies have reported different types of short- and long-term synaptic regulatory phenomena induced by specific gliotransmitters released from astrocytes in several brain areas (Araque et al., 2014). Yet, whether a single astrocyte releases different gliotransmitters or whether different astrocyte subpopulations release distinct gliotransmitters remains unknown. Furthermore, the cellular signaling processes that regulate the release of different gliotransmitters need to be identified to better understand the synaptic consequences of astrocytic activation on network function. Calcium elevations evoked by activation of type 1 cannabinoid receptors (CB1Rs) (Navarrete and Araque, 2010; Gómez-Gonzalo et al., 2015; Navarrete and Araque, 2008), group I metabotropic glutamate receptors (mGluRs) (Perea and Araque, 2005; Fellin et al., 2004), muscarinic acetylcholine receptors (mAChRs) (Navarrete et al., 2012) or GABAB receptors (GABABRs) (Perea et al., 2016; Kang et al., 1998) in hippocampal astrocytes have been shown to stimulate the release of glutamate (Navarrete and Araque, 2010; Perea et al., 2016; Gómez-Gonzalo et al., 2015; Navarrete and Araque, 2008; Navarrete et al., 2012; Kang et al., 1998). 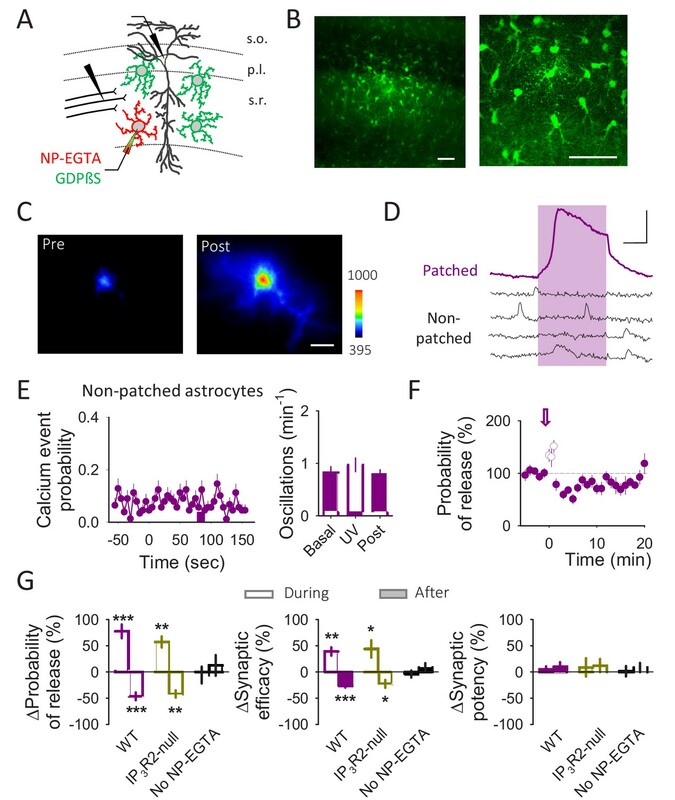 Astrocytic glutamate has been shown to transiently enhance the probability of neurotransmitter release at CA3-CA1 synapses through activation of type 1 receptors (mGluR1s) (Navarrete and Araque, 2010; Perea et al., 2016; Gómez-Gonzalo et al., 2015; Navarrete et al., 2012), and potentiate or depress inhibitory transmission through activation of kainate or group II/III metabotropic glutamate receptors, respectively (Kang et al., 1998; Liu et al., 2004a, 2004b). In contrast, hippocampal astrocytes have also been shown to release ATP which, after being degraded to adenosine, controls basal hippocampal synaptic activity (Panatier et al., 2011) and tonically depresses neurotransmission (Pascual et al., 2005). 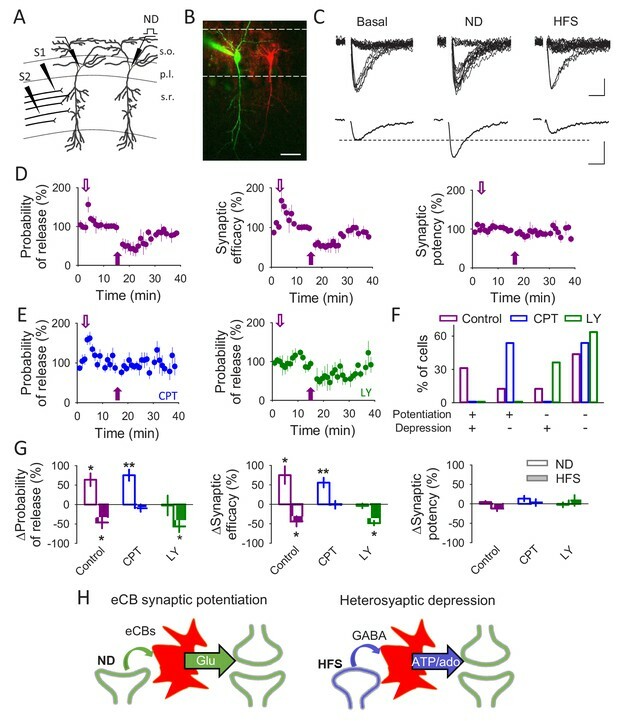 Astrocytic purinergic signaling also mediates heterosynaptic depression (Pascual et al., 2005; Boddum et al., 2016; Serrano et al., 2006; Zhang et al., 2003; Chen et al., 2013), which has been proposed to involve successive events that include activation of GABAergic interneurons, release of GABA that activates GABABR in astrocytes, and astrocytic Ca2+ elevations that trigger the release of ATP which, after being converted to adenosine by extracellular ectonucleotidases, activates neuronal A1Rs that depress synaptic transmission (Boddum et al., 2016; Serrano et al., 2006). Using hippocampal astrocytes and CA3-CA1 synapses as a paradigmatic tripartite synapse model, we sought to determine whether single astrocytes release both glutamate and ATP and determine the neuronal stimulating conditions that control the differential release of these gliotransmitters. We found that single astrocytes may release both glutamate and ATP, which evoke a biphasic regulation of the probability of neurotransmitter release at single hippocampal synapses. The amplitude and temporal characteristics of this regulation depended on the neuronal activity pattern that stimulated astrocytes. These results indicate that astrocytes decode the time and frequency of neuronal activity, responding with the release of different gliotransmitters that differentially regulate synaptic function. Astrocytes are known to induce synaptic potentiation or heterosynaptic depression of CA3-CA1 synapses through the release of glutamate or ATP, respectively (Navarrete and Araque, 2010; Perea and Araque, 2007; Pascual et al., 2005; Boddum et al., 2016; Serrano et al., 2006; Zhang et al., 2003; Chen et al., 2013). To study whether single synapses can be regulated by distinct gliotransmitters, we used the minimal stimulation approach, which is considered to allow monitoring single or very few synapses (Navarrete and Araque, 2010; Perea and Araque, 2007; Isaac et al., 1996; Raastad, 1995; Allen and Stevens, 1994), and tested whether they could undergo both synaptic regulatory phenomena (mediated by astroglial glutamate and ATP/adenosine). We recorded pairs of CA1 pyramidal neurons and monitored unitary excitatory postsynaptic currents (EPSCs) evoked by minimal stimulation of Schaffer collaterals (SC)(Figure 1), and applied the two stimulation paradigms that are known to evoke either astrocyte-mediated synaptic potentiation or heterosynaptic depression (Figure 2A). First, we depolarized one neuron (from −70 to 0 mV, 5 s) to induce eCB release (Navarrete and Araque, 2010; Navarrete and Araque, 2008; Chevaleyre and Castillo, 2004; Kreitzer and Regehr, 2001; Wilson and Nicoll, 2001; Ohno-Shosaku et al., 2002) and quantified parameters of synaptic transmission in the other neuron to assess the eCB-induced synaptic potentiation (Navarrete and Araque, 2010). Then, we applied a high-frequency stimulation (HFS; 3 trains of stimuli at 100 Hz for 1 s, delivered every 30 s) in an independent set of SC synapses to elicit the heterosynaptic depression (Pascual et al., 2005; Serrano et al., 2006) (Figure 2A,B,H). Consistent with previous reports (Navarrete and Araque, 2010), neuronal depolarization (ND) induced a transient increase in the probability of release (n = 5 neurons; p=0.018) and synaptic efficacy (p=0.029) without significant changes in the synaptic potency (p=0.187; Figure 2C,D). The HFS protocol induced a longer lasting transient decrease in the probability of release (p=0.039) and synaptic efficacy (p=0.013) without significant changes in the synaptic potency (p=0.321; Figure 2C,D). Both the ND-evoked synaptic potentiation and the HFS-evoked depression were observed in 31.25% (5 out of 16 neurons) of putative single synapses (Figure 2F). As expected, the ND-evoked synaptic potentiation was prevented in the presence of the mGluR1 antagonist LY367385 (100 µM; n = 4 neurons; p=0.928; Figure 2E–G) and in the astroglial GFAP-CB1-null mice (Han et al., 2012; Martin-Fernandez et al., 2017) (n = 10; p=0.8) (Figure 2—figure supplement 1A–D), which specifically lack CB1Rs in GFAP-expressing astrocytes (cf. Figure 2—figure supplement 2). To confirm that astrocytes in GFAP-CB1-null mice selectively lacked CB1Rs, we tested the astrocyte responsiveness to the CB1R agonist WIN55-212,2 and to ATP in slices obtained from WT and GFAP-CB1-null mice. While astrocytes from GFAP-CB1-null mice did not respond to WIN55-212,2 (n = 91 astrocytes from n = 10 slices, p=0.462), they show robust calcium responses to ATP (p<0.001), indicating that astrocytes remained functional but selectively lack CB1R-mediated responses. Moreover, CB1R-mediated neuronal responses in these mice were also assessed by monitoring the depolarization-induced suppression of inhibition (DSI), a process known to be mediated by presynaptic activation of CB1 receptors (Chevaleyre and Castillo, 2004; Kreitzer and Regehr, 2001; Wilson and Nicoll, 2001; Ohno-Shosaku et al., 2002). Both wildtype and GFAP-CB1-null mice showed similar DSI, indicating that CB1Rs were specifically absent in astrocytes in GFAP-CB1-null mice (Figure 2—figure supplement 2). In contrast to ND-evoked synaptic potentiation, the HFS-mediated heterosynaptic depression was blocked by the A1 receptor (A1R) antagonist CPT (2 µM; n = 6 neurons; p=0.253) (Figure 2E–G) but still present in the GFAP-CB1-null mice (n = 5; p=0.004; Figure 2—figure supplement 1E–H). These results indicate that a putative single synapse can be modulated by both glutamate and ATP/adenosine released by astrocytes in response to ND or HFS, respectively. Unitary CA3-CA1 synapse recordings from hippocampal pyramidal neurons. (A) Fluorescent images showing a pyramidal cell expressing GFP (green) and an astrocyte loaded with Texas Red (red) through the recording pipette. Scale bars: 20 µm. (B) Schematic drawing depicting a recorded CA1 pyramidal neuron and the stimulating electrode. (C) Representative EPSC traces obtained with the minimal stimulation technique showing successes and failures in neurotransmitter release (n = 20; upper panel) and the average trace acquired from those traces (synaptic efficacy; lower panel). Scale bars: 5 pA, 10 ms. (D) EPSC amplitudes of a representative synapse that showed failures (grey) and successes (black) in neurotransmitter release (left panel) and its corresponding histogram (right). (E) Synaptic parameters (synaptic efficacy, synaptic potency and probability of release) obtained from representative recordings (n = 40 synapses). A single synapse can be modulated by different gliotransmitters. (A) Schematic drawing depicting paired recordings from CA1 pyramidal neurons and the stimulating electrodes (S1 and S2). (B) Fluorescent image showing two pyramidal cells, one loaded with Texas Red (red) and the other one with Alexa 488 (green). Scale bar: 40 µm. (C) Representative EPSC traces (n = 20) and their average traces during basal conditions, after a neuronal depolarization (ND) and after a HFS. Scale bars: 5 pA, 10 ms. (D) Synaptic parameters vs time in control conditions. Open and filled arrows indicate ND and HFS, respectively. (E) Probability of release vs time in the presence of CPT (2 µM) or LY367385 (100 µM). Open and filled arrows indicate ND and HFS, respectively. (F) Percentage of cells that underwent synaptic potentiation, depression, both or no change in the different conditions. (G) Relative changes in synaptic parameters after ND and HFS in control conditions (n = 5) and in the presence of CPT (2 µM; n = 6) or LY367385 (100 µM; n = 4). (H) Schematic summary depicting the signaling pathways leading to eCB-mediated synaptic potentiation or heterosynaptic depression. Data are represented as mean ± s.e.m., *p<0.05, **p<0.01. While some studies proposed that heterosynaptic depression involves GABABR-mediated astrocytic release of ATP after interneuron activation by HFS of SC (Figure 2H) (Serrano et al., 2006), other studies have reported a GABABR-mediated astrocytic glutamate release by direct interneuron stimulation that leads to a synaptic potentiation (Perea et al., 2016; Kang et al., 1998). Because those reports used two different forms of interneuron stimulation, that is, direct interneuron depolarization or synaptic stimulation, we hypothesized that the differences in the type of gliotransmitter released (glutamate vs ATP/adenosine) depend on the interneuron firing pattern. To test the effects of interneuron activity on astrocytic responses and CA3-CA1 synaptic transmission, we recorded pairs of interneurons and CA1 pyramidal neurons. We monitored Ca2+ signals in stratum radiatum astrocytes and the SC-induced unitary EPSCs in the pyramidal cell, and stimulated interneurons with a train of short depolarizing pulses to trigger action potentials at 20 Hz (for 90 s), as previously reported for interneurons (Hu et al., 2014; Pike et al., 2000) (Figure 3A,B,G). Interneuron stimulation induced astrocyte Ca2+ elevations (n = 143 astrocytes in n = 17 slices; p<0.001; Figure 3C–F) that were prevented by the GABABR antagonist CGP54626 (1 µM; n = 85 astrocytes in n = 9 slices; p=0.795) but not by the GABAAR antagonist picrotoxin (n = 157 astrocytes in n = 16 slices; p<0.001; Figure 3F), indicating that interneurons stimulate astrocytes through GABABR activation. 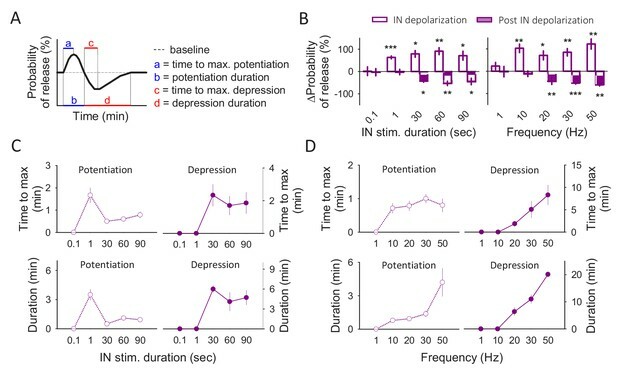 In addition, interneuron activity induced a relatively fast transient potentiation of synaptic transmission that was followed by a longer-lasting synaptic depression (n = 5 neurons; Pr potentiation p=0.012; Pr depression p=0.024; Figure 3H–J). Both phenomena were unaffected by picrotoxin (n = 6 neurons; Pr potentiation p=0.002; Pr depression p<0.001) but abolished by CGP54626 (n = 9 neurons; Pr potentiation p=0.25; Pr depression p=0.849; Figure 3J), indicating that they were selectively mediated by activation of GABABRs. To confirm GABABRs involvement in the astrocyte Ca2+ signals and the biphasic synaptic regulation we applied baclofen (90 s), a GABABR agonist, into the stratum radiatum while monitoring astrocyte Ca2+ and synaptic currents in the pyramidal neuron (Figure 3—figure supplement 1A). Baclofen application induced Ca2+ increases in 49 ± 8% of the recorded astrocytes (n = 61 astrocytes in n = 11 slices; p<0.001; Figure 3—figure supplement 1B) and a biphasic synaptic regulation (n = 6; Pr potentiation p<0.001; Pr depression p=0.034; Figure 3—figure supplement 1C), mimicking results obtained with interneuron depolarization. Taken together, these results suggest that astrocytes mediate interneuron-induced potentiation and depression of transmitter release. To test this idea, we used the inositol-1,4,5-triphosphate (IP3) receptor type 2 knock-out (IP3R2-null) mice (Li et al., 2005), in which G protein-mediated Ca2+ mobilization is selectively impaired in astrocytes (Di Castro et al., 2011; Martín et al., 2015; Gómez-Gonzalo et al., 2015; Navarrete et al., 2012; Petravicz et al., 2008). In these mice, interneuron depolarization failed to both elevate astrocytic Ca2+ (n = 74 astrocytes in n = 10 slices; p=0.719; Figure 3E,F) and induce the potentiation or depression of neurotransmitter release (n = 9 neurons; Pr potentiation p=0.749; Pr depression p=0.489; Figure 3J). Astrocytes differentially modulate synaptic transmission in response to neuronal activity. (A) Schematic drawing depicting paired recordings from a CA1 pyramidal neuron and a S. R. interneuron and the stimulating electrode. Representative traces showing the interneuron depolarization train are displayed as insets. (B) Fluorescence image showing an interneuron loaded with Texas Red (Red) and astrocytes loaded with Fluo4-AM (Green). Scale bar: 40 µm. (C) Pseudocolor images showing the fluorescence intensities of Fluo4-AM of the 3 astrocytes marked in panel B before (basal) and during the interneuron stimulation. Scale bars: 10 µm. (D) Representative calcium traces obtained from the 3 astrocytes marked in panel B. The pink area represents the stimulus duration (interneuron depolarization, 20 Hz during 90 s). Scale bar: 40%, 30 s. (E) Calcium event probability vs time in the WT and in the IP3R2-null mice. The pink area corresponds with the duration of the stimulus. (F) Changes in the calcium event probability 15 s before (Basal) and 15 s after the stimulation started (stimulation) in control conditions (n = 143 astrocytes), in the IP3R2-null mice (n = 74 astrocytes), in slices loaded with GDPßS (10 mM; n = 60 astroyctes), in the presence of picrotoxin (PTX, 50 µM; n = 157 astrocytes) or CGP54626 (1 µM; n = 85 astrocytes) and in the astroglial GABAB-null (n = 53 astrocytes). (G) Fluorescence image of a CA1 pyramidal cell loaded with Alexa 488 (Green) and an interneuron loaded with Texas Red (Red). Scale bar: 50 µm. (H) Representative EPSC traces (n = 20) and their average traces before (basal), during and after the interneuron depolarization train. Scale bars: 5 pA, 20 ms. (I) Synaptic parameters vs time in control conditions. Zero time corresponds with the beginning of the IN depolarization train (arrow). The open circles represent the synaptic parameters measured during the IN depolarization train. (J) Relative changes in synaptic parameters during and after the IN depolarization train in control conditions (n = 5), in the IP3R2-null mice (n = 9), in slices loaded with GDPßS (n = 7), in the presence of Picrotoxin (PTX, 50 µM; n = 6), CGP54626 (1 µM; n = 9) and in the astroglial GABAB-null (n = 9). Data are represented as mean ± s.e.m., *p<0.05, **p<0.01, ***p<0.001. We further tested the astrocyte involvement on the synaptic biphasic regulation loading the astrocytic network with GDPβS through a patch pipette to specifically block G protein signaling in astrocytes. In GDPβS-loaded slices interneuron depolarization failed to induce astrocyte Ca2+ elevations (n = 60 astrocytes in n = 8 slices; p=0.53; Figure 3F) and to induce the biphasic synaptic regulation (n = 7 neurons; Pr potentiation p=0.3; Pr depression p=0.538; Figure 3J). In addition, we used GABAB-null mice that has been reported to lack GABAB receptors specifically in astrocytes (Perea et al., 2016). We first confirmed that GABAB-mediated astrocyte responses were absent in these transgenic mice. While astrocytes from GABAB-null mice did not respond to baclofen (n = 74 astrocytes from n = 6 slices, p=0.418), they responded to ATP (p<0.001), indicating that astrocytes were functional but selectively lacked GABABR-mediated responses. Furthermore, neurons from wildtype and GABAB-null mice similarly responded to baclofen, indicating that GABABRs were specifically absent in astrocytes in GABAB-null mice (Figure 3—figure supplement 2). In this transgenic line, interneuron stimulation failed to induce Ca2+ elevations in astrocytes (n = 53 astrocytes in n = 10 slices; p=0.23; Figure 3F) and the biphasic synaptic regulation (n = 9 neurons; Pr potentiation p=0.75; Pr depression p=0.9; Figure 3J). Taken together, these data indicate that GABAB-mediated astrocyte Ca2+ signaling is necessary to induce the interneuron-evoked potentiation and depression of synaptic transmission. To further test these results in identified interneurons, we used the PV+ transgenic mice that express the fluorescent protein tdTomato in parvalbumin-positive interneurons (Figure 3—figure supplement 3A,B). In agreement with previous results, stimulation of identified PV+ interneurons with trains of depolarizing pulses to fire action potentials at 20 Hz elicited the biphasic synaptic regulation (n = 5 neurons; Pr potentiation p=0.01; Pr depression p=0.001; Figure 3—figure supplement 3C,D), which was abolished in the presence of the GABABR antagonist CGP (n = 5 neurons; Pr potentiation p=0.821; Pr depression p=0.94; Figure 3—figure supplement 3D). These results indicate that interneuron-evoked stimulation of astrocytes leads to the potentiation and depression of synaptic transmission. We then investigated what type of gliotransmitters mediate the synaptic potentiation and depression evoked by interneuron depolarization. The mGluR1 antagonist LY367385 (100 µM) prevented the initial potentiation but did not affect the delayed depression (n = 4 neurons; Pr potentiation p=0.976; Pr depression p<0.001; Figure 4A,B), which, in contrast, was abolished by the A1R antagonist CPT (2 µM; n = 7 neurons; Pr potentiation p<0.001; Pr depression p=0.131; Figure 4A,B). These results, which are consistent with the effects of ND and HFS, respectively (see Figure 2), indicate that the synaptic potentiation and depression induced by interneuron activity are mediated by activation of mGluR1 and A1Rs, respectively. Notably, the interneuron-evoked astrocyte Ca2+ signal was unaffected by the receptor antagonists (n = 96 astrocytes in n = 11 slices p<0.001 and n = 109 astrocytes in n = 11 slices p<0.001 in the presence of LY367385 and CPT, respectively; Figure 4C,D), suggesting that glutamate and ATP/adenosine are released downstream of the GABAB-mediated astrocyte Ca2+ signal. Taken together, these results indicate that interneuron activity activates astrocyte gabaBRs that elevate Ca2+ and stimulates the release of glutamate and ATP/adenosine, leading to the biphasic modulation of synaptic transmission, that is, an initial glutamate-induced synaptic potentiation followed by a purine-induced synaptic depression. Astrocytes release glutamate and ATP/adenosine in response to neuronal activity. (A) Synaptic parameters vs time in the presence of CPT (2 µM) or LY367385 (100 µM). Zero time correspond with the beginning of the IN depolarization train (arrow). The open circles show the synaptic parameters measured during the IN depolarization train. (B) Relative changes in synaptic parameters during and after the IN depolarization train in the presence of CPT (2 µM; n = 7) or LY367385 (100 µM; n = 4). (C) Calcium event probability vs time in the presence of CPT (2 µM) or LY367385 (100 µM). The pink area corresponds with the duration of the stimulus. (D) Changes in the calcium event probability 15 s before (basal) and 15 s after the stimulation started in the presence of CPT (2 µM; n = 109 astrocytes) or LY367385 (100 µM; n = 96 astrocytes). Data are represented as mean ± s.e.m., *p<0.05, **p<0.01, ***p<0.001. Present results indicate that a putative single synapse can be regulated by both astrocytic glutamate and ATP/adenosine. Rodent hippocampal astrocytes occupy separate anatomical domains with minimal overlap between astrocytic processes (Bushong et al., 2002; Halassa et al., 2007; Wilhelmsson et al., 2006), thus it is likely that a single synapse may spatially interact with only a single astrocyte (see Figure 1A), which suggests that a single astrocyte releases different gliotransmitters. However, recent evidence suggests that astrocytes are a heterogeneous population of cells with different functional properties (Khakh and Sofroniew, 2015; Chai et al., 2017), suggesting that different gliotransmitters could be released from different astrocytes. To test these hypotheses, we stimulated a single astrocyte and monitored a putative single synapse (Figure 5A), using the astrocyte-mediated hippocampal synaptic regulation as a functional assay to test whether a single astrocyte can release both glutamate and ATP/adenosine. A single astrocyte regulates single synapses downstream of the GABAergic activity. (A) Schematic drawing depicting paired recordings from one pyramidal neuron and one astrocyte filled with NP-EGTA, GDPβS filling the astrocytic network, and the stimulating electrode. (B) Fluorescence images of an astrocyte network loaded with biocytin through the patched astrocyte. Scale bars: 50 µm. (C) Pseudocolor images representing fluorescence intensities of a Fluo4 loaded astrocyte before (pre) and after (post) UV light-induced calcium uncaging. Scale bar: 10 µm. (D) Representative calcium traces of NP-EGTA loaded astrocyte (patched; purple trace) and other astrocytes in the field of view loaded with GDPßS (non-patched; black traces). The pink area represents the UV light stimulation. Scale bar: 50%, 30 s. (E) Calcium event probability vs time (left panel) and number of calcium oscillations per minute (right panel) observed in the non-patched astrocytes. (F) Probability of release vs time. Zero time corresponds with the beginning of the calcium uncaging (arrow). The open circles show the probability of release measured during UV light illumination. (G) Relative changes in synaptic parameters during and after UV light stimulation of astrocytes filled with NP-EGTA (5 mM) and GDPßS (10 mM) recoded form WT (n = 9) and IP3R2-null mice (n = 6) and in the absence of NP-EGTA (n = 7). Data are represented as mean ± s.e.m., *p<0.05, **p<0.01, ***p<0.001. To stimulate a single astrocyte, we loaded one astrocyte with the Ca2+ cage NP-EGTA (5 mM) and Fluo4 (to monitor astrocyte Ca2+) through the recording pipette and photo-stimulated with UV light to elevate Ca2+ in the recorded astrocyte, bypassing the GABABR-induced Ca2+ signaling. To ensure the stimulation of only the NP-EGTA filled astrocyte, the recording pipette also contained GDPßS (10 mM) to fill the gap junction-connected astrocytic syncytium (Figure 5B) to prevent G protein-mediated intercellular astrocytic signaling (Navarrete et al., 2012). UV light stimulation elevated astrocyte Ca2+ levels in the NP-EGTA-loaded astrocyte (Figure 5C,D) but not in the surrounding astrocytes in the field of view (Figure 5D,E); probably due to the lack or insufficient gap junction diffusion of NP-EGTA into neighboring astrocytes. Light-evoked Ca2+ elevations in a single astrocyte elicited an initial potentiation followed by a longer-lasting depression of the synaptic transmission (n = 9 neurons; Pr potentiation p<0.001; Pr depression p<0.001; Figure 5F,G), as similarly observed by synaptically activated astrocytes (see e.g. Figure 3I). In the absence of NP-EGTA, UV light stimulation did not affect the synaptic parameters (n = 7 neurons; Pr potentiation p=0.894; Pr depression p=0.551; Figure 5G; cf. [Perea and Araque, 2007]). In addition, light-evoked Ca2+ uncaging rescued the biphasic synaptic modulation in the IP3R2-null mice (n = 6 neurons; Pr potentiation p<0.003; Pr depression p=0.002; Figure 5G), indicating that astrocytic glutamate and ATP/adenosine are release downstream of the astrocyte Ca2+ signaling. Therefore, activation of a single astrocyte is sufficient to induce glutamate- and purine-mediated synaptic modulation, indicating that one astrocyte can release at least two different gliotransmitters. Present results indicate that glutamate released from astrocytes had a relatively rapid and transient effect on synaptic transmission when compared to ATP/adenosine effects, which occurred with a delayed and slower time course. We then investigated whether the astrocytic synaptic regulation mediated by glutamate and ATP/adenosine was time- and frequency-dependent on neuronal activity. We stimulated interneurons with trains of 20 Hz depolarizing pulses of different duration (100 ms, 1 s, 30 s, 60 s and 90 s) and analyzed the synaptic parameters in the recorded pyramidal neuron (Figure 6A). A relatively short stimulation train (100 ms) was insufficient to affect the probability of neurotransmitter release (n = 6 neurons; Pr potentiation p=0.945; Pr depression p=0.87; Figure 6B), however, interneuron depolarization for 1 s induced the transient synaptic potentiation but not the synaptic depression (n = 6 neurons; Pr potentiation p<0.001; Pr depression p=0.852; Figure 6B). Notably, this synaptic potentiation lasted longer than the potentiation observed during the biphasic phenomenon (3.5 ± 0.56 min and 0.93 ± 0.2 min for 1 and 90 s stimulation, respectively; Figure 6C), suggesting that the astrocytic glutamate effect is curtailed by the ATP/adenosine effect. 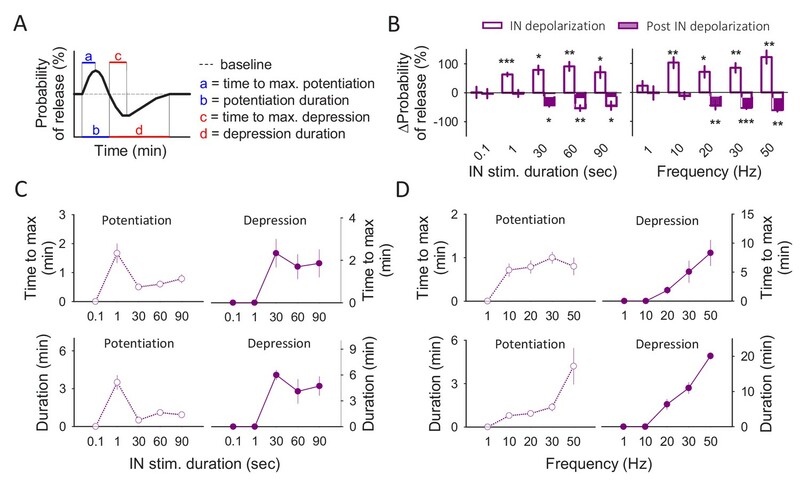 This idea is further supported by the fact that the duration of the potentiation was longer after being pharmacologically isolated than during the biphasic modulation when the delayed depression occurred (Figure 4—figure supplement 1B–D). Frequency and stimulus duration dependence of gliotransmitter release. (A) Schematic illustration of the astrocyte-induced synaptic modulation and the parameters measured. (B) Percentage of effect (potentiation or depression) when the interneurons were depolarized at 20 Hz for different time windows (left panel) and when interneurons were depolarized during 90 s at different frequencies (right panel). (C) Time to maximum effect and effect duration with the different stimulation durations. (D) Time to maximum effect and effect duration with the different stimulation frequencies. Data are represented as mean ± s.e.m., *p<0.05, **p<0.01, ***p<0.001. Moreover, purine-induced depression of neurotransmitter release required relatively long depolarizing trains (30, 60 and 90 s; Figure 6B,C). These results indicate that relatively short stimuli are sufficient to induce glutamate- but not ATP/adenosine-mediated synaptic regulation by astrocytes, whereas sustained neuronal activity is required to elicit astrocytic ATP/adenosine-mediated synaptic depression. We finally investigated the dependence of the biphasic synaptic regulation on the interneuron firing frequency. We depolarized interneurons to fire action potentials at different frequencies (1, 10, 20, 30 or 50 Hz for 90 s). At a relatively low firing rate (1 Hz), neither the potentiation nor the depression of synaptic transmission were observed (n = 8 neurons; Pr potentiation p=0.722; Pr depression p=0.937; Figure 6B), indicating that a relatively low interneuron activity is insufficient to activate neuronal receptors by gliotransmitters. At 10 Hz firing rate, only the synaptic potentiation was present whereas the synaptic depression was absent (n = 7 neurons; Pr potentiation p=0.002; Pr depression p=0.407; Figure 6B), suggesting a lower threshold for the glutamate-mediated synaptic regulation than for ATP/adenosine-mediated synaptic depression. At 20 Hz, the synaptic potentiation reached a maximum at 0.79 ± 0.15 min and lasted for 0.93 ± 0.2 min, when the synaptic depression started. The synaptic depression lasted for 6.36 ± 1.47 min reaching a maximum at 1.86 ± 0.65 min. At 30 and 50 Hz both the potentiation and the synaptic depression lasted longer (synaptic potentiation duration 1.38 ± 0.28 min and 4.2 ± 1.26 min, respectively; synaptic depression duration 11 ± 1.6 min and 20.1 ± 0.9 min, respectively; Figure 6B,D), indicating that stronger neuronal activity leads to a longer effect of gliotransmission. In summary, for both the duration and firing rate of interneuron activity, the amplitude of the synaptic potentiation and depression is relatively constant beyond a threshold value, which is lower for the potentiation than for depression for both the duration and firing rate of interneuron activity (Figure 6B). Regarding the duration of interneuron activity dependence, once the synaptic depression appears, its time to maximum and its duration are relatively constant. In contrast, the time to maximum and the duration of the synaptic potentiation is higher at a relatively lower stimuli duration, indicating that it is curtailed by the synaptic depression (Figure 6C). Regarding the dependence on interneuron firing rate, the time to maximum of the synaptic potentiation is relatively similar at the different frequencies, but its duration increased as the firing rate increased. On the contrary, the time to maximum and the duration of the synaptic depression is increased as the firing rate increased (Figure 6D). Taken together, these results indicate that the effects of gliotransmission on synaptic transmission were time- and activity-dependent on the neuronal firing, suggesting that astrocytes decode both the temporal and frequency characteristics of the neuronal activity, which leads to the differential regulation of synaptic transmission by different gliotransmitters. Present results show that a single astrocyte can release glutamate and ATP/adenosine that potentiate and depress neurotransmitter release, respectively. We show that astrocytes can decode neuronal activity and release glutamate and ATP/adenosine depending on the neuronal activity. That is, relatively short or low frequency stimulation patterns induce glutamate release from astrocytes resulting in a potentiation of the probability of neurotransmitter release; while prolonged or relatively high frequency stimulus also induce ATP/adenosine release from astrocytes, leading to a depression of synaptic transmission (Figure 7). These results show that astrocytes decode neuronal activity and tune their response differentially modulating synaptic transmission. Schematic of the signaling pathways involved in gliotransmitter release. (A) Low frequency or short interneuron stimulation induces glutamate release from astrocytes leading to a potentiation of neurotransmitter release. (B) High frequency or prolonged interneuron stimulation induces glutamate and ATP/adenosine release from astrocytes leading to a synaptic potentiation followed by a synaptic depression. A great amount of data have been reported in the last two decades showing the implication of astrocytes in synaptic modulation, through different mechanisms involving different gliotransmitters (Navarrete and Araque, 2010; Perea et al., 2016; Perea and Araque, 2007; Min and Nevian, 2012; Henneberger et al., 2010; Gómez-Gonzalo et al., 2015; Navarrete et al., 2012; Pascual et al., 2005; Serrano et al., 2006; Takata et al., 2011). In the hippocampus, astrocytes are well known to release glutamate, ATP, GABA, and D-serine (Panatier et al., 2011; Perea et al., 2016; Henneberger et al., 2010; Navarrete and Araque, 2008; Pascual et al., 2005; Serrano et al., 2006; Le Meur et al., 2012); however, it remained unknown whether a single astrocyte can release all of them or, on the contrary, there are specialized astrocyte subtypes that release each gliotransmitter. Present results show that astrocyte Ca2+ elevations induced by endogenous stimuli (GABA released during interneuron activity) lead to a glutamate- and ATP/adenosine-mediated biphasic modulation of neurotransmitter release, an effect that was mimicked by the artificial but direct and selective activation of a single astrocyte with Ca2+ uncaging, indicating that both gliotransmitters can be released from a single astrocyte. These results suggest that the ability of releasing different gliotransmitters is not diversified in different astrocyte subopulations, but that single hippocampal astrocytes have the ability to release both gliotransmitters. Present results were obtained using the minimal stimulation approach, which is considered to allow monitoring the activity of single or very few synapses based on the relatively low amplitude and stability of the synaptic responses (Navarrete and Araque, 2010; Mariotti et al., 2018; Chen et al., 2013; Isaac et al., 1996; Raastad, 1995). However, the inherent limitation of the approach remained uncertain whether single or few synapses were activated. Nevertheless, the fact that the synaptic potency remained unchanged throughout the experiments indicates that the same synapse or synapses were monitored. Our results show that the synaptic effects of astrocytic glutamate and ATP/adenosine have different dynamics that lead to a biphasic regulation. Whether this temporal difference is due to different temporal properties of the gliotransmitter release or the upstream or downstream signaling mechanisms requires further investigation. For example, it could be feasible that the cellular machinery responsible for glutamate release is faster than for ATP/adenosine release. Alternatively, if both gliotransmitters are co-released, the buildup of the extracellular concentration of the gliotransmitter, the diffusion properties of the gliotransmitter to reach the appropriate receptors, the location of neuronal receptors in relation to the gliotransmitter source, or the neuronal receptor affinity, are important elements that may account for the different temporal effects. Nevertheless, regardless the actual cellular mechanism, present results indicate that different gliotransmitters can be released from a single astrocyte, but with different temporal effects on synaptic activity and under the control of the neuronal activity that signal to astrocytes. Figure 6 shows that astrocytes decode the interneuron activity tuning the release of gliotransmitters. Indeed, different duration or frequency of interneuron activity result in different astrocyte-mediated synaptic modulation. While relatively short stimuli only induced glutamate-mediated potentiation, sustained neuronal activity induced the biphasic synaptic modulation mediated by the initial glutamate-mediated component followed by the ATP/adenosine- phenomenon, suggesting that two temporal thresholds might exist, one for glutamate and another for ATP/adenosine effects. Likewise, while relatively low firing frequencies induces glutamate-mediated potentiation of neurotransmission, relatively high firing frequencies induce glutamate- and ATP/adenosine-mediated biphasic modulatory phenomenon. These results show a relationship between the stimulus frequency and gliotransmission, where glutamate effects occurred at low and high frequency stimuli while ATP/adenosine effects occur only at higher frequencies. Moreover, a slower time course of the biphasic synaptic modulation occurred at higher firing frequencies, indicating that when the neuronal activity is high the effect of the gliotransmission is longer lasting. Therefore, two different intensity thresholds also exist for glutamate and ATP/adenosine effects. As indicated above, whether these temporal and intensity thresholds are due to different gliotransmitter release mechanisms or to downstream signaling mechanisms requires further studies. Interestingly, the GABABR-mediated biphasic synaptic regulatory phenomenon obtained with either interneuron depolarization or with direct baclofen application showed a slower time course than the responses obtained from neuronal ionotropic receptors. This is not surprising considering that this biphasic regulatory phenomenon requires astrocytic GABABR activation, astrocyte Ca2+ signaling in astrocytes and astrocytic glutamate and ATP/adenosine release. In fact, it is known that astrocyte Ca2+ signaling occurs in a slow and prolonged manner (Volterra et al., 2014; Araque et al., 2014; Rusakov, 2015) probably due to a different expression of GABABRs by distinct astrocyte; to the fact that astrocyte responses require the build-up of extracellular GABA released from synaptic terminals, which may not reach all the monitored astrocytes; or the number of steps involved in activation of G protein-mediated signaling pathways and intracellular Ca2+ mobilization. Present results indicate that synaptic depression is mediated by activation of adenosine A1 receptors. While adenosine can be released through Ca2+-independent mechanisms (Martín et al., 2007; Dale et al., 2000), ATP is released in a Ca2+-dependent manner (Panatier et al., 2011; Serrano et al., 2006). Whether adenosine was directly released by astrocytes or was derived from ATP requires further studies out of the scope of the present work. Nevertheless, the dependence of the synaptic effects on astrocyte Ca2+ suggests that the gliotransmitter released is ATP. Indeed, the synaptic depression is absent in IP3R2-null mice, in which G protein mediated Ca2+ signal is impaired in astrocytes (Figure 3J), and astrocyte Ca2+ uncaging is sufficient to induce the synaptic depression (Figure 5). Besides glutamate and ATP/adenosine, other gliotransmitters, such as D-serine, have been shown to be released by hippocampal astrocytes (Henneberger et al., 2010; Shigetomi et al., 2013). While our study focused on glutamate and ATP/adenosine signaling, further studies are needed to determine whether D-serine can also be released by the same astrocytes, which seems likely because present results indicate that single astrocytes are competent to release different gliotransmitters. In summary, present results show that single astrocytes release different gliotransmitters depending on neuronal activity, by decoding neuronal activity and adjusting their response to distinct physiological stimuli to differentially regulate synaptic transmission. Therefore, astrocytes decipher and integrate synaptic information to differentially regulate synaptic activity through the release of different gliotransmitters depending on the stimulating neuronal activity. All of the procedures for handling and sacrificing animals were approved by the University of Minnesota Institutional Animal Care and Use Committee (IACUC) in compliance with the National Institutes of Health guidelines for the care and use of laboratory animals (#1701A34507). Mice were housed under 12/12 hr light/dark cycle and up to five animals per cage. Hippocampal slices were obtained from male and female C57BL/6J (12–21 days old), IP3R2-null (12–21 days old) (Li et al., 2005; Zimmer et al., 1999), Pvalb-Cre/Ai9-rcl-tdTomato (PV+, 12–21 days old; JAX #008069/#007909), GFAP-CB1-null (12–20 week old) (Han et al., 2012; Martin-Fernandez et al., 2017) and GLAST-GABAB-null (12–20 week old) (Perea et al., 2016). IP3R2-null mice were generously donated by Dr. J. Chen. To generate astroglial Cnr1-/- (GFAP-CB1-null) mice carrying the ‘‘floxed’’ Cnr1 gene (Cn1f/f) were crossed with Gfap-CreERT2 mice, using a three step backcrossing procedure we obtained Cnr1f/f;Gfap-CreERT2 (GFAP-CB1-null mice). Astroglial GABAB-null was generated by crossbreeding Gabbr1fl/fl (MGI:3512742) carrying the ‘floxed’ Gabbr1 gene (Haller et al., 2004) with Glast-CreERT2 knock-in mice (MGI:3830051) (Mori et al., 2006). R26-lsl-GCaMP3 mice (JAX #014538) (Paukert et al., 2014) were crossbred to astroglial Gabbr1-/- mice to express the genetically encoded Ca2+ indicator GCaMP3 specifically in astrocytes. As CreERT2 protein is inactive in the absence of tamoxifen treatment, deletion of the Cnr1 or Gabb1 genes was obtained in adult mice (8 weeks) by eight daily injections of tamoxifen (1 mg, i.p. ), dissolved in 90% sunflower oil, 10% ethanol to a final concentration of 10 mg/ml. The animals were used at least 4 weeks after tamoxifen treatment. Cnr1f/f and Gabbr1fl/fl mice injected with tamoxifen were used as WT controls for GFAP-CB1-null and GABAB-null mice, respectively. Animals were anaesthetized and decapitated. The brain was rapidly removed and placed in ice-cold artificial cerebrospinal fluid (ACSF). Slices 350 μm thick were made and incubated (>30 min) at room temperature in ACSF containing (in mM): NaCl 124, KCl 5, NaH2PO4 1.25, MgSO4 2, NaHCO3 26, CaCl2 2, and glucose 10, and was gassed with 95% O2/5% CO2 (pH = 7.3–7.4). Slices were transferred to an immersion recording chamber, superfused at 2 ml/min with gassed ACSF and visualized under an Olympus BX50WI microscope (Olympus Optical, Japan). Electrophysiological recordings from CA1 pyramidal neurons and Stratum radiatum (S. R.) interneurons were made in whole-cell configuration of the patch-clamp technique. Patch electrodes had resistances of 3–10 MΩ when filled with the internal solution containing (in mM): KMeSO4 135, KCl 10, HEPES 10, NaCl 5, ATP-Mg+2 2.5, and GTP-Na+ 0.3 (pH = 7.3). In some experiments astrocytes were patched with 4–9 MΩ electrodes filled with an intracellular solution containing (in mM): KMeSO4 100, KCl 50, HEPES-K 10, and ATP-Na+2 4 (pH = 7.3). Recordings were obtained with PC-ONE amplifiers (Dagan Instruments, MN, US). Membrane potential was held at −70 mV for neurons and −80 mV for astrocytes. Series and input resistances were monitored throughout the experiment using a −5 mV pulse. Cells were discarded when series and input resistances changed >20%. Signals were fed to a Pentium-based PC through a DigiData 1440A interface board. Signals were filtered at 1 KHz and acquired at 10 KHz sampling rate. The pCLAMP 10.4 (Axon instruments) software was used for stimulus generation, data display, acquisition and storage. Inhibitory postsynaptic potentials (IPSCs) were isolated in the presence of CNQX (20 µM) and AP5 (50 µM) to block AMPA and NMDA receptors, respectively. Theta capillaries filled with ACSF were used for bipolar stimulation and placed in the S. R. to stimulate Schaffer collaterals (SC). Paired pulses (2 ms duration with 50 ms interval) were continuously delivered at 0.33 Hz using a stimulator S-910 through an isolation unit. Putative excitatory post-synaptic currents (EPSCs) were recorded from pyramidal neurons. Stimulus intensity (0.1–10 mA) was adjusted to meet the conditions that putatively stimulate single or very few presynaptic fibers (cf. [Navarrete and Araque, 2010; Perea and Araque, 2007; Isaac et al., 1996; Raastad, 1995; Allen and Stevens, 1994]). Synaptic parameters analyzed were: probability of release (ratio between the number of successes versus total number of stimuli); synaptic efficacy (mean peak amplitude of all responses including successes and failures) and synaptic potency (mean peak amplitude of the successes, excluding failures) (Navarrete and Araque, 2010; Perea and Araque, 2007; Gómez-Gonzalo et al., 2015; Navarrete et al., 2012). A response was considered a failure if the amplitude of the current was <3 times the standard deviation of the baseline current (0.7–2.3 pA) and was verified by visual inspection. The high frequency stimulation (HFS) paradigm consisted in a Tetanic stimulation (3 trains at 100 Hz for 1 s delivered every 30 s) delivered on independent SC pathways. The independence of the SC pathways was confirmed by stimulating both pathways with time intervals of 50 ms and observing no cross-facilitation of the EPSCs. During the neuronal depolarization (ND) protocol one pyramidal neuron was depolarized to 0 mV for 5 s to stimulate endocannabinoid release (Navarrete and Araque, 2010; Navarrete and Araque, 2008; Chevaleyre and Castillo, 2004; Kreitzer and Regehr, 2001; Wilson and Nicoll, 2001; Ohno-Shosaku et al., 2002). During the interneuron depolarization train paradigm, the interneuron was recorded in current-clamp mode and depolarized so it fired action potentials at 1, 10, 20, 30 or 50 Hz for 90 s. Interneurons were also depolarized at 20 Hz for 100 ms, 1, 30, and 60 s. To determine the interneuron firing frequency, interneurons were depolarized for 13 ms and repolarized so they fired a single action potential in every depolarization (Figure 3A). During the interneuron depolarizing train, synaptic activity was continuously monitored at 0.33 Hz in the pyramidal neuron. To illustrate the time course of the effects of the stimuli, synaptic parameters were grouped in 30 or 60 s bins. To determine synaptic changes, mean EPSCs (n = 60 EPSCs) recorded 3 min before the stimulus (basal) were compared with mean EPSCs (n = 20 EPSCs) after the stimulus (for potentiation) or after the initial transient synaptic potentiation subsided (for depression). The synaptic potentiation or depression was determined to occur in individual synapses when the probability of release determined after the stimuli changed more than two standard deviations from the baseline. Figure 2F and Figure 4—figure supplement 1A shows the percentage of synapses undergoing potentiation, depression, both or no change. Synapses that did not show synaptic regulation in control conditions were not further considered. This selection criteria was necessary because pulling together results from regulated or unregulated synapses would result in the concealment of the effects (Lines et al., 2017). Considering that the regulation of single or few synapses was analyzed, it is not unexpected that in some experiments the stimulus was inefficient to regulate some synapses, perhaps simply due to the absence of functional connectivity between the stimulated astrocyte and the recorded synapse. Hence, for pharmacology experiments and experiments using transgenic mice, a relatively large sample size is used, thus the absence of the phenomena can be assumed by never being observed in the recorded population. Ca2+ levels in astrocytes located in the S. R. of the CA1 region of the hippocampus were monitored by fluorescence microscopy using the Ca2+ indicator fluo-4-AM. Astrocytes where loaded with fluo-4-AM by incubating the slices with fluo-4-AM (2 μM and 0.01% of pluronic) for 45–60 min at room temperature (Parri et al., 2001; Perea and Araque, 2005; Kang et al., 1998; Araque et al., 2002; Nett et al., 2002). Astrocytes were imaged using a CCD camera (Hammamatsu, Japan). Cells were illuminated during 100 ms with a LED at 490 nm (Prior Scientifics, MA, US), and images were acquired every 2 s. The LED and the CCD camera were controlled and synchronized by the MetaMorph software (Molecular devices). ImageJ software (NIH) was used for quantitative epifluorescence measurements. Ca2+ variations recorded at the soma of the cells were estimated as changes of the fluorescence signal over baseline (ΔF/F0), and cells were considered to show a Ca2+ event when ΔF/F0 increased two times the standard deviation of the baseline. The astrocyte Ca2+ signal was quantified from the astrocyte Ca2+ event probability, i. e., the probability of occurrence of a Ca2+ elevation, which was calculated from the number of Ca2+ elevations. The time of occurrence of a Ca2+ event was determined at the onset of the Ca2+ event. Astrocyte Ca2+ events obtained from 5 to 25 astrocytes in the field of view during the recording period were grouped in 5 s bins. For each astrocyte analyzed, values of 0 and 1 were assigned for bins showing either no response or a Ca2+ event, respectively. To test the effects on Ca2+ event probability under different conditions, the basal (15 s before the stimulus) and maximum Ca2+ event probability (15 s after stimulus) were averaged and compared. Single astrocytes were recorded with patch pipettes filled with the internal solution containing 5 mM NP-EGTA, 160 µM fluo-4-AM to -monitor Ca2+ levels and GDPßS (10 mM). Ca2+ uncaging was achieved by illuminating the slice with UV light during 90 s using a 430–480 nm LED (Prior Scientifics, MA, US). Single astrocytes were recorded with patch pipettes and filled with internal solution containing 0.5% biocytin. Slices were fixed in 4% PFA in 0.1 PBS (pH 7.4) at 4°C. Slices were washed three times in 1xPBS (10 min each). To visualize biocytin slices were incubated with Alexa488-Streptavidin (RRID:AB_2315383; 1:500) for 48 hr at 4°C. Slices were finally washed for 3 times with 1xPBS (10 min each) and mounted with Vectashield mounting media (Vector laboratories). Data are expressed as mean ± standard error of the mean (SEM). Results were compared using a two-tailed, paired Student’s t-test (α = 0.05). Statistical differences were established with p<0.05 (*), p<0.01 (**) and p<0.001 (***). Blind experiments were not performed in the study but the same criteria were applied to all experimental groups. Randomization was not employed. Sample size was based on values previously found sufficient to detect significant changes in hippocampal synaptic parameters in past studies performed in the lab. (S)-(+)-α-Amino-4-carboxy-2-methylbenzeneacetic acid (LY367385), (2S)−3-[(1S)−1-(3,4-Dichlorophenyl)ethyl]amino-2-hydroxypropyl](phenylmethyl)phosphonic acid hydrochloride (CGP 55845) were purchased from Tocris Cookson (Bristol, UK); Fluo-4-AM, Fluo-4 cell impermeant and o-nitrophenyl EGTA, tetrapotassium salt (NP-EGTA) from Molecular Probes (Eugene, OR); and Picrotoxin from Indofine Chemical Company (Hillsborough, NJ). All other drugs were purchased from Sigma. Annual Review of Physiology 63:795–813. The Journal of Physiology 526:143–155. Annual Review of Physiology 72:335–355. Frontiers in Computational Neuroscience 6:59. Frontiers in Cellular Neuroscience 11:367. Frontiers in Computational Neuroscience 6:93. The Journal of Physiology 529:205–213. European Journal of Neuroscience 7:1882–1888. Thank you for submitting your work entitled "Neuronal activity determines distinct gliotransmitter release from a single astrocyte" for consideration by eLife. Your article has been evaluated by a Senior Editor and three reviewers, one of whom is a member of our Board of Reviewing Editors. The reviewers have opted to remain anonymous. Our decision has been reached after consultation between the reviewers. Based on these discussions and the individual reviews below, we regret to inform you that your work will not be considered further for publication in eLife. The reviewers agreed that determining the mechanisms that enable astrocytes to influence synaptic transmission and plasticity is critically important and that the strategies you employed to explore the modulatory output of single astrocytes were elegant. The idea that the release of ATP and glutamate are induced by different stimuli was also seen as an important discovery. However, there was consensus that the complexity of the system creates challenges for studies based on pharmacological manipulations and the reviewers thought that targeted gene deletion from astrocytes is necessary to provide a definitive test of the model. In addition, there were concerns raised about the manner of data analysis, the reliance on failures, rather than paired pre- and post-synaptic recording, and the use of non-physiological stimuli in some experiments. Together, the reviewers thought that these issues reduced the overall impact of the study. 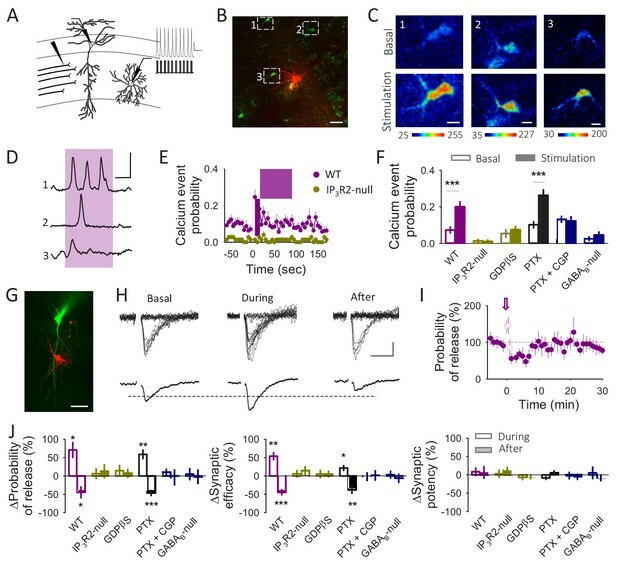 This report by Covelo and Araque describes a technically challenging set of experiments in hippocampal slices to explore the involvement of astrocyte calcium signaling in the regulation of excitatory Schaffer collateral commissural synapses in the CA1 region. Gliotransmitter release and the role of astrocytes in synaptic modulation continue to be intensely debated within the field, with substantial evidence accumulated both for and against this hypothesis. Developing a minimal system in which key players can be adequately controlled and manipulated would help advance this field. The studies in this report rely on "minimal stimulation" to isolate a small number of synapses, providing a more rigorous evaluation of this phenomenon than can be achieved with large scale extracellular stimulation. Using paired recordings, calcium imaging and calcium uncaging in astrocytes, and manipulations of PV interneurons, the authors derive a complex model to describe how individual astrocytes can release either glutamate or ATP, depending on the duration and amplitude of the stimulus, in response to GABA release from interneurons. Of note, the study would benefit from a summary diagram outlining the major pathways involved; at times, I found it difficult to follow the manipulations and the assumptions that were made. As with any complex system, there are many possible pathways that could be responsible for the observed effects, particularly because the time course of the events is slow – the stimulus duration, calcium rises in astrocytes and the potentiation – and the receptors targeted by the pharmacological manipulations are expressed by multiple cell types. Without greater control of receptors on specific cells other interpretations are possible. Accordingly, there are several concerns that should be addressed to ensure that the authors' interpretation of these elegant manipulations is correct. 1) The studies build upon the author's prior work indicating that pyramidal neuron depolarization elicits cannabinoid release that induces synaptic potentiation. It was unclear to me from the experiments performed whether astrocytes were the site of action or interneurons. Clearly the latter have been shown to be a target in this region of the hippocampus, as this is where DSI was first demonstrated. Some evidence of cannabinoid receptor involvement in the phenomena described here would be helpful to establish the initial conditions. To counter possible complications from neuronal CB1 receptors, the authors should consider analyzing astrocyte-specific CB1 receptor knockout mice. If the central hypothesis is correct, this should abolish both potentiation and depression of SC EPSCs. 2) The studies rely on minimal stimulation to isolate one or a few synapses. This approach has been used previously in this region. Although not as powerful as paired recordings, the hippocampal system is not amenable to this approach, as it is difficult to find pairs of synaptically coupled CA3-CA1 neurons in slices. Accordingly, there are many caveats with minimal stimulation, as it is certain that many axons are stimulated (although one or a few may be connected to the cell being recorded from). In order to perform failure analysis and determine release probability (used in much of the quantification throughout the study), it is necessary to be able to resolve successes from failures. In this region, it is very challenging to do so, because EPSC amplitudes can be very small (plots of mEPSC amplitudes do not show a clear separation from the noise and events), creating challenges for this type of analysis. In Figure 1D, the large separation between successes and failures is concerning, as this degree of separation is not typical for these synapses. The sharp boundary of the smallest events suggests that anything below 5pA was cut off, creating an artifactual separation that enhances the ability to distinguish successes and failures. The issue should be addressed. 3) I am confused about the manner of data representation in several of the experiments. The authors report that 31% of "single synapses" showed modulation. Do the p values represent all experiments or only those that showed modulation? This data selection should be avoided unless there is a clear mechanistic argument to support this heterogeneity. There are similar issues for the calcium signals from astrocytes. Here it is important to define what is meant by the metric "calcium event probability". What accounts for the variability in responsiveness (certain cells respond) and variability in calcium increases? If baclofen were applied acutely, does it elicit similar responses (calcium increases in astrocytes and biphasic changes in Pr)? What accounts for the delay in response of astrocytes – that is, if this is a simple mobilization of IP3 following GABAB receptor activation, why is the onset so variable? 4) A key experiment suggesting the involvement of astrocytes involves analysis of synaptic potentiation and depression in IP3R2 ko mice. The authors should perform a control experiment to show that calcium uncaging in astrocytes in IP3R2 ko mice leads to the same biphasic change in Pr. 5) Because GABAB receptors are expressed by multiple cell types, the authors should consider performing these experiments in astrocyte specific conditional knockout mice. Such experiments would lend stronger support for the proposed model of neuromodulation. Studies on the ability of astrocytes to regulate ongoing synaptic transmission have focused on release of an individual gliotransmitter from astrocytes and one type of regulation such as potentiation or depression of presynaptic release probability. This paper addresses whether one astrocyte can induce both potentiation and inhibition of presynaptic release at the same synapse, via the release of different transmitters. The study shows that the effect of astrocytes on synapses is time and neuronal activity-dependent. Astrocytes first potentiate presynaptic release via glutamate acting on mGluRs. After a delay presynaptic release is inhibited via adenosine acting on A1 receptors. The duration and intensity of neuronal activation regulates the astrocyte/synapse response, with low intensity activation only causing synaptic potentiation, and high intensity stimulation causing both. Showing that one astrocyte can have both effects on the same synapse is interesting, but it is hard to interpret the physiological meaning of the results the way they are currently presented. The incorporation of a model figure depicting the proposed circuit connections between the principal neurons, interneurons and astrocytes would help in interpretation, as would addressing the following questions about whether the neuronal stimulation parameters used correlate with endogenous firing properties of the neurons. These points do not need new experiments to address them. In Figure 3 activation of the interneuron causes potentiation of an excitatory synapse (via the astrocyte). Is this known/expected to happen? Are the stimuli used for interneuron activation within the range of what is normally recorded in the hippocampus (20Hz for 90sec)? Is there evidence that astrocytes undergo prolonged somatic calcium rises (seconds)? The effects on synapses on the whole seem to be on a slow timescale (minutes). Does the size of the astrocyte calcium response correlate with the outcome at the synapse, i.e. just potentiation, or potentiation followed by depression? In Figure 3 the astrocyte calcium increases at the start of interneuron stimulation but has decayed back to baseline after 25sec even though the neuronal stimulus lasts for 90sec – is this a saturating effect? The author (and others in the astrocyte field) has developed a consistent story over the past years describing a link between astrocyte calcium signals and alteration of neuronal synaptic responses. Based on pharmacological blockers the scenario is that CB1 receptor stimulation of astrocytes triggers calcium signals that in turn trigger glutamate release from astrocyte that enhances synaptic transmission. This excitatory response is transient and is mediated by mGluR1 receptors. The second pathway is proposed to be due to GABAB-mediated calcium transients in astrocytes (activated by GABA release from interneurons) causes ATP release from astrocytes and subsequent depression of neuronal activity due to adenosine formation from degradation of ATP. In the context of these previous studies that were reported in publications from this lab and others, the authors have designed experiments to determine whether one astrocyte can have similar actions of excitation and inhibition. They provide evidence supporting their conclusion that calcium signals in one identified astrocyte can lead to both types of synaptic modifications. However the authors have no data that ATP is released from astrocytes under these circumstances. Their data show that there is an adenosine-mediated depression of synaptic responses and the role for ATP release is inferred from other studies. The authors describe the results using several parameters such as potency, probability of release and synaptic efficacy. These are defined as "probability of release (ratio between the number of successes versus total number of stimuli); synaptic efficacy (mean peak amplitude of all responses) and synaptic potency (mean peak amplitude of the successes)". From the data presented in Figure 1C it appears that the impact on synaptic release is to change the failure rate for evoked epscs using this experimental paradigm. The authors describe the potency presumably as the amplitude of the evoked epscs excluding the failures. This part of the data presentation is confusing and should be clarified in the figure legend as well as the brief description in the Materials and methods. For example in Figure 2C the actual evoked responses are shown in the top traces and the average responses are shown in the lower traces. These averages must also include the failures as well as the evoked synaptic currents. For example the response in ND appear to have several responses with smaller amplitude and the responses during the HFS appear to be identical to the basal responses. This could be important because of the implication of the mechanism. The authors conclude that the release of transmitter at synapses is inhibited. However the impact may be the inhibition of the propagation of action potentials or failure of spikes to invade the presynaptic terminal instead of depression of synaptic release mechanisms. "These results indicate that interneuron-evoked stimulation of astrocytes leads to the potentiation and depression of synaptic transmission." This conclusion depends on the assumption that IP3R2 receptors are only in astrocytes and this assumption should be clearly stated. It is certainly true that IP3R2 are important for the calcium signals linked to Gq coupled GPCRs. The references cited here all deal with the loss of calcium signaling in astrocytes in the IP3R2 knockout mouse. However it is possible that there are IP3R2 receptors in some neurons or specific neuronal compartments. The conclusion that this is solely due to astrocytes would require an astrocyte selective knockout of IP3R2 and I am not aware of this evidence (although I could be wrong). The authors should also be aware of several studies showing that calcium signaling stills occurs in fine processes of astrocytes in the IP3R2-/- transgenic mouse. The authors have provided intriguing evidence that the pattern of action potential firing in interneurons will lead to the synaptic enhancement or synaptic depression. This is a remarkable finding that the authors have convincingly shown using a very impressive strategy involving paired recordings from identified cells in brain slices. The initial comparison in Figure 2 for neuronal depolarization (CB1 mediated enhancement) versus high frequency stimulation (GABAG mediated) seems puzzling. The authors could describe more clearly the rationale for these initial experiments then the progression to the interneuron specific responses. In particular why was no initial enhancement of synaptic responses observed in Figure 2D, compared to the enhancement in Figure 3I? The authors have conducted many additional experiments to address the concerns raised and have clarified some issues that were confusing. As a result, the manuscript is much improved. However, I have several additional comments. 1) The bar graphs analyzing changes in release probability, potency, etc. show effects that were present during the initial time after the manipulation. Please indicate the frequency of test stimulation after the inducing stimulus (I might have missed it, but wasn't able to find this in the Materials and methods). Given that repetitive stimulation is required to assess these parameters, it is important to indicate how many responses were used to calculate these averages. 2) The inclusion of astrocyte-specific deletion experiments for CB1Rs and GABABRs is a terrific addition to the study. However, the authors need to provide evidence that this genetic manipulation was effective by directly assessing the effects of a CB1 agonist and GABA/baclofen on Ca changes in astrocytes, similar to experiments shown in Figure 3—figure supplement 1. It should be noted that both manipulations (using GFAP-CreER) may lead to deletion of CB1 receptors from radial glia and thus eventually dentate granule neurons, with unknown consequences for the tri-synaptic hippocampal circuit. 3) I am not convinced by either the data or the argumentation that the responses recorded represent exclusively single synapses. Although the author correctly indicates that this approach has been used previously, there remains considerable uncertainty that is inherent to the approach. 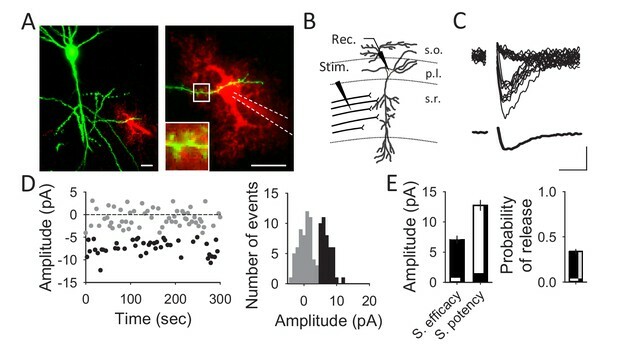 Description of responses as single synapses should formally be reserved for paired recordings in which the number of functional connections can be directly established (typically through post-hoc immunolabeling). For example, the representative example data shown in Figure 1D highlights the difficulty in defining what is a single synapse response, as the response amplitude clearly varies continuously with no clear separation between what are deemed successes and failures (by coloration). The statements surrounding single synapses should be softened to allow for this uncertainty. 4) I remain concerned about the use of data selection in the manuscript. Data should not be excluded simply because the cells did not respond as expected. Exclusion criteria should be clearly defined, for example, if the authors were to show that astrocytes varied in their expression of receptors, by challenging cells at the end of the experiment with a selective agonist. Regarding the source of variability, please indicate what proportion of astrocytes exhibited Ca increases in response to baclofen application. The authors have addressed the questions I raised in the first round of review in a satisfactory manner. The other reviewers raised more substantive concerns. In particular, the point reviewer 1 raised about the ability of minimal stimulation in the CA3-CA1 pathway to be monitoring the same synapse every time seems particularly important for the interpretation of the data – that one synapse is both potentiated and depressed by different gliotransmitters from the same astrocyte. Additionally, the new experiments using tamoxifen-inducible astrocyte-specific KO lines of different receptors don't appear to have any validation in this paper (there are references provided but one is from a different lab, and the other uses recombination in younger animals), so this is something that needs adding, or a more detailed explanation of validation of the models should be provided in the Materials and methods. I am impressed by the additional data that the authors have provided to deal with questions from me and the other reviewers. The additional clarification of several issues such as the description of the measured synaptic parameters and schematic summaries have greatly helped. The inclusion of data from using astroglial CB1R-/- mice, astroglial GABABR-/- mice, IP3R2-/- mice are very powerful and convincing additions to their body of evidence pointing to the complexity of astrocyte modulation of synaptic activity. In addition the new experiment to block G protein signalling in astrocytes (by injecting GDPbetaS into astrocytes) to block astrocyte calcium elevations and biphasic synaptic regulation was a clever addition. The inclusion of new genetic knock-down experiments and selective depression of astrocyte signaling provides convincing data and answers the issues raised in the first reviews. We thank the reviewer for the positive comments and suggestions that helped to strengthen the paper. As suggested, summary diagrams outlining the major pathways involved have been included in new Figure 2H and new Figure 7. In addition, the following paragraph has been added in the Discussion section: “interestingly, the GABABRmediated biphasic synaptic regulatory phenomenon obtained with either interneuron depolarization or with direct baclofen application showed a slower time course than the responses obtained from neuronal ionotropic receptors. […] In fact, it is known that astrocyte Ca2+ signaling occurs in a slow and prolonged manner (Volterra, Liaudet and Savtchouk, 2014; Araque et al., 2014; Rusakov, 2015) probably due to a different expression of GABABRs by distinct astrocyte; to the fact that astrocyte responses require the build-up of extracellular GABA released from synaptic terminals, which may not reach all the monitored astrocytes; or the number of steps involved in activation of G protein-mediated signaling pathways and intracellular calcium mobilization”. […] Showing that one astrocyte can have both effects on the same synapse is interesting, but it is hard to interpret the physiological meaning of the results the way they are currently presented. The incorporation of a model figure depicting the proposed circuit connections between the principal neurons, interneurons and astrocytes would help in interpretation, as would addressing the following questions about whether the neuronal stimulation parameters used correlate with endogenous firing properties of the neurons. These points do not need new experiments to address them. We thank the reviewer for the positive comments and the helpful suggestions. As suggested, a summary diagram outlining the major pathways involved has been included in Figure 2H and Figure 7. This is an excellent question. Indeed, in vivo electrophysiological recordings have shown that hippocampal interneurons can fire action potentials at different frequencies that vary from 20 Hz during theta activity to >100 Hz during sharp wave ripples (see Pike et al., 2000 and Hu, Gan and Jonas, 2014). The following has been included in the text: “We monitored Ca2+ signals in stratum radiatum astrocytes and the SC-induced unitary EPSCs in the pyramidal cell, and stimulated interneurons with a train of short depolarizing pulses to trigger action potentials at 20 Hz (for 90 s), as previously reported for interneurons (Hu, Gan and Jonas, 2014; Pike et al., 2000) (Figure 3A, B, G)”. We initially used this stimulation paradigm (20Hz for 90sec) to clearly reveal the effects, but the phenomena were further characterized using different frequencies and duration of the stimulus to test dependence of gliotransmitter release on these parameters (Figure 6). This is an excellent question, but intrinsic experimental limitations associated with Ca2+ indicators prevent a clear answer. The amplitude of Ca2+ signal depends on the concentration of both intracellular Ca2+ and the fluorescent dye. 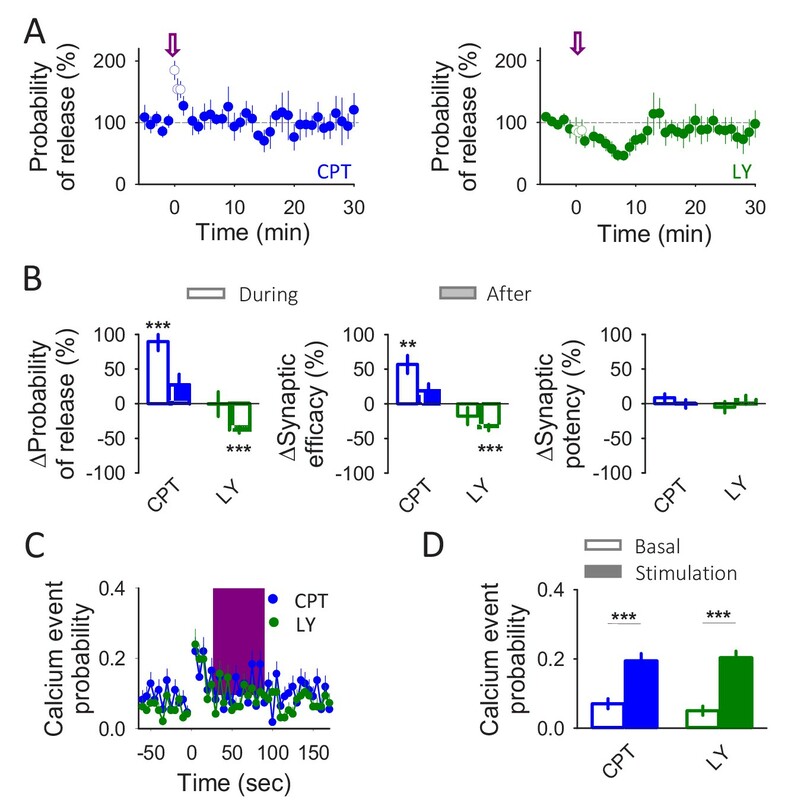 Because the latter cannot be accurately estimated in brain slices, the recorded signal provides a qualitative estimation of the Ca2+ changes within the cell. We hence used the calcium event probability as a parameter indicative of astrocyte activity, but we refrained to establish correlations between changes in Pr and qualitative Ca2+ levels because they might be misleading. We thank the reviewer for the positive comments and useful suggestions that have helped strengthening our conclusions. We agree with the reviewer that ATP release is indirectly assessed from the synaptic effects of its metabolic product adenosine. Astrocytes have been shown to be able to release adenosine and ATP in calcium-independent and calcium-dependent manner, respectively. Therefore, the gliotransmitter released is likely ATP because the synaptic depression it is absent in IP3R2-/- mice, in which G protein mediated calcium signal is impaired in astrocytes, and astrocyte calcium uncaging is sufficient to induce the synaptic depression. Nevertheless, we have referred throughout the text to ATP/adenosine, because present study focuses on synaptic transmission regulation. We have clarified the issue in the Discussion: “Present results indicate that synaptic depression is mediated by activation of adenosine A1 receptors. […] Indeed, the synaptic depression is absent in IP3R2-/- mice, in which G protein mediated Ca2+ signal is impaired in astrocytes (Figure 3J), and astrocyte Ca2+ uncaging is sufficient to induce the synaptic depression (Figure 5).”. The authors describe the results using several parameters such as potency, probability of release and synaptic efficacy. These are defined as "probability of release (ratio between the number of successes versus total number of stimuli); synaptic efficacy (mean peak amplitude of all responses) and synaptic potency (mean peak amplitude of the successes)". From the data presented in Figure 1C it appears that the impact on synaptic release is to change the failure rate for evoked epscs using this experimental paradigm. The authors describe the potency presumably as the amplitude of the evoked epscs excluding the failures. This part of the data presentation is confusing and should be clarified in the figure legend as well as the brief description in the Materials and methods. For example in Figure 2C the actual evoked responses are shown in the top traces and the average responses are shown in the lower traces. These averages must also include the failures as well as the evoked synaptic currents. For example the response in ND appear to have several responses with smaller amplitude and the responses during the HFS appear to be identical to the basal responses. This could be important because of the implication of the mechanism. The statistical analysis of synaptic transmission changes indicate that they are due to changes in the probability of neurotransmitter release without changes in the synaptic potency (Figure 2G, 3J, 4B and 5G). Therefore, traces in Figure 2C simply reflect the intrinsic variability of the EPSC amplitude (see Figure 1D). The authors conclude that the release of transmitter at synapses is inhibited. However the impact may be the inhibition of the propagation of action potentials or failure of spikes to invade the presynaptic terminal instead of depression of synaptic release mechanisms. We agree with the reviewer that synaptic depression may be due to failures in action potential invasion or in the release machinery. Regardless the potential presynaptic mechanism, which is out of the scope of the present work, the final synaptic outcome is the inhibition of transmitter release. We consequently refrained to propose any mechanism, and simply described the depression of the presynaptic transmitter release. This conclusion is further supported by the demonstration that astrocyte Ca2+ uncaging is sufficient to induce the synaptic regulation in WT and IP3R2-/- mice (Figure 5) and by the new results showing the lack of astrocyte Ca2+ elevations and synaptic regulation in the Astroglial GABABR-/- mice. Regarding the question “In particular why was no initial enhancement of synaptic responses observed in Figure 2 D, compared to the enhancement in Figure 3 I?” it should be noted that data in Figure 2D and 3I corresponds to two different stimulation paradigms. In Figure 2D, astrocytes were activated by HFS of SC (as described by reference Serrano et al., 2006), which prevented the adequate simultaneously recording of synaptic transmission parameters during the HFS. We agree with the reviewer that an initial synaptic potentiation was expected during the HFS protocol, but it was concealed due to the experimental limitations of the protocol used. In contrast, such initial enhancement shown in Figure 3I, could be monitored because astrocytes were activated by direct stimulation of whole-cell recorded interneurons, which did not interfere which the simultaneous analysis of EPSCs. For that reason, the rest of the experiments were performed using the strategy of paired recordings from pyramidal cells and interneurons. The manuscript has been revised to address the comments of reviewer 1 and 2 (reviewer 3 had no further comments). We apologize for the lack of sufficient details in the previous version of the manuscript. We have now clarified the issue. Synaptic parameters were acquired at 0.33Hz, as indicated in the Materials and methods section: “Paired pulses (2 ms duration with 50 ms interval) were continuously delivered at 0.33 Hz” and “during the interneuron depolarizing train, synaptic activity was continuously monitored at 0.33 Hz in the pyramidal neuron”. Likewise, “We first confirmed that GABAB-mediated astrocyte responses were absent in these transgenic mice. While astrocytes from GABAB-null mice did not respond to baclofen (n=74 astrocytes from n=6 slices, p=0.418), they responded to ATP (p<0.001), indicating that astrocytes were functional but selectively lacked GABABR-mediated responses. Furthermore, neurons from wildtype and GABAB-null mice similarly responded to baclofen, indicating that GABABRs were specifically absent in astrocytes in GABAB-null mice (Figure 3—figure supplement 2)”. Regarding the comment on the possible deletion of receptors in radial glia, we agree with the reviewer that manipulations using GFAP-CreER may lead to deletion of CB1 receptors from radial glia and eventually dentate granule neurons. Although this could lead to changes in circuit hippocampal function, we believe that our present results on the astrocyte regulation at the synapse level are not compromised by potential alterations of network function. We understand the reviewer´s concern about this sensitive issue. Our selection criteria was that synapses that did not show regulation in control conditions were not further considered. Considering that we were analyzing the regulation of single or few synapses, it is not unexpected that in some experiments the stimulus was inefficient to regulate some synapses, perhaps simply due to the absence of functional connectivity between the astrocyte stimulated and the synapse recorded. Because pulling together results from regulated or unregulated synapses would result in the concealment of the effects, as we have recently reported (Lines et al., 2017), the selection of the regulated synapses is therefore required. Nevertheless, the proportion of cells showing the phenomena are reported (Figure 2F and Figure 4—figure supplement 1). The authors have addressed the questions I raised in the first round of review in a satisfactory manner. The other reviewers raised more substantive concerns. In particular, the point reviewer 1 raised about the ability of minimal stimulation in the CA3-CA1 pathway to be monitoring the same synapse every time seems particularly important for the interpretation of the data – that one synapse is both potentiated and depressed by different gliotransmitters from the same astrocyte. Additionally, the new experiments using tamoxifen-inducible astrocyte-specific KO lines of different receptors don't appear to have any validation in this paper (there are references provided but one is from a different lab, and the other uses recombination in younger animals), so this is something that needs adding, or a more detailed explanation of validation of the models should be provided in the Materials and methods. We thank R Quintana and S Jamison for technical help; Dr. J Chen (UCSD, USA) for providing IP3R2-null mice; Dr. G Marsicano for providing the GFAP-CB1-null; Dr. F Kirchhoff, Dr. D E Bergles and Dr. A Agarwal for providing the astroglial GABAB-null and GCaMP3 mice; and Dr. R Gomez, Dr. A Diez, M Martin-Fernandez, C Durkee, J Lines, M Corkrum and A Ferro for helpful suggestions. This work was supported by NIH-NINDS (R01NS097312-01) and Human Frontier Science Program (Research Grant RGP0036/2014) to AA. The authors declare no financial competing interests. Animal experimentation: All of the procedures for handling and sacrificing animals were approved by the University of Minnesota Institutional Animal Care and Use Committee (IACUC) in compliance with the National Institutes of Health guidelines for the care and use of laboratory animals (#1701A34507). © 2018, Covelo et al.